04/23/2007 – The Ovo is finally Full Production! The Ovo Mark II is ready for sale. The best and only affordable safe colloidal gold system for the home user. The Ovo Colloidal Gold Reactor System is a breakthrough in colloidal gold systems in that it is the first system for making colloidal gold of any quality and substantiation that is based on the electrolytic process. The Ovo is the first and only of its kind offering ease of use and affordability priced to be compatible with the cost and standards of a decent colloidal silver system. At only $250.00 USD the Ovo Mark II is priced to be affordable yet packed with utility and features that make it easy and safe. Never before has such a powerful yet affordable system been available. This entirely new technology uses electrolysis as part of a reaction to make colloidal gold in concentrations up to 45ppm. 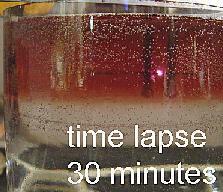 A 20 minute run makes 200-250ml of colloidal gold at approx 20ppm. If you have always wanted to make colloidal gold for yourself but didn’t have time or money to invest on complicated and expensive equipment, this is the colloidal gold system for you! Every aspect has been designed to be easy and safe while delivering a colloidal gold that is above the concentrations most widely sold. Total is $618.00 USD (shipping included) for any destination on the planet! # Brief Background: The Ovo process was developed by Metospheric Plasma Products research in April 2006. Previously and currently no other company or individual has been able to manifest such a simple and effective method for colloidal gold making that serves the personal use demand. These are exceptionally nice units for the price. The main body is 4mm thick glass and high grade plastic. 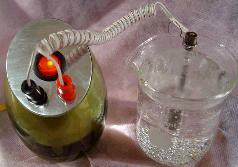 The reactor tube is made of a special low expansion lab glass that is also very thick to endure long use. The unit has a lighted green power switch and a fused power supply. (extra fuse included with each unit) The exposed components in solution are food service grade 310 stainless steel and glass to ensure a sterile non-toxic exposure to the submerged portions of the reactor tube. Each unit comes with everything you need to get started. 5. 20ml Medicine dropper to measure your 3% H202 solution. The current design is the result of 1 year of development and field testing to ensure that the Ovo can meet the demands of longevity and durable use. 1. Take out your reactor tube and use the stainless steel clip to secure it inside of the 250ml beaker. 2. 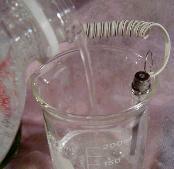 Fill your 250ml beaker with seltzer water until 3 of the 4 ports on the reactor tube are submerged. 5. Make sure you time your batch with a watch or timer and run for no longer than 20 minutes. Exactly 15-20 minutes and not a second more until you read how to gage your system by temperature! # 1. Find a source of No Sodium Seltzer Water. What you are looking for is a soda water that does not include (sodium citrate, sodium bicarbonate) which are trace in many soda waters as a product of the production process. You can find no-sodium soda water and seltzer water in many local stores, bars make soda water for drinks (they may give you a good deal on a pint or two) and soda water makers with a CO2 cartridge are also viable options for your source of Soda Water. The primary aspect of soda water that is important is the concentration of Carbon Dioxide. # 2. Hydrogen Peroxide. A topical 3% Hydrogen Peroxide can be found in many pharmacies. What you need to know is that non-food grade H202 found in most pharmacies has tin based stabilizers. Food Grade Hydrogen Peroxide comes in concentrations of 35% and does not contain these stabilizers that are considered unhealthy for ingestion. Both kinds work for the Ovo process however it is advise able to order 35% H202 from a supplier on the internet, or local store and dilute this by 1 part 35% H202, 10 parts distilled water. This gives you a solution of H202 at 3%.When you have these two ingredients you are ready to make colloidal gold! # Silver – Very shortly an new electrode array shall be available that allows you to also make colloidal silver. The rate and process of this new electrode array that plugs into the Ovo is unique as it classifies as not only an electrolysis device but also as an arc/vapor application. Check back often as (today is May 12,2007) this new add on is in development as I write this. A full addition to this manual should be ready in 8 days. Price expected to be $50.00 however for new purchases we are going to include them for $25.00 most likely. For this procedure you shall need. 3. Read these instructions before actually doing anything. 4. The picture above is to help you see what the photos do not, the inside of the reactor tube. 5. When you feel you understand the instructions, then proceed. B. Find the top of the reactor tube. C. Slide the gold wire gently into the top hole about 1 inch. Do not force the wire! D. Now, grasp firmly between two fingers the gold wire fairly close to the tube (choke up on the wire) so that you can push the gold wire a little at a time until there is less than 1 inch left sticking from the top of the reactor tube. F. You can use your fingernail to make the wire end flush with the wire port as shown. G. A 22gage copper electrode was provided that can be used to help push the gold wire down into the electrode port. H. Make sure you push the gold wire down far enough so that the end is resting on the last glass insulator ring as shown in the picture. This ensures that the insulation is able to protect the end of the wire from contact with the stainless steel grid. 1.0 – The first pre-production prototypes had these, they are easily identified by the single1/8th” mono jack for the reactor tube connection. If you have one of these (you also have a version 1 power supply) and should consider trading your unit in for the latest version. B. Require special gap adjustment. C. Possible short circuit if not adjusted properly for each run. 2.0 – These reactor tubes were designed with several features that overcame issues that were shown in the first version. Essentially they were re-built from the ground up to reflect the demands that were known after several months of field testing. A. 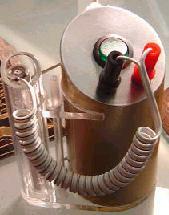 Glass insulators inside of the tube prevent short circuit between the 2 electrode elements. B. A top loading all stainless steel junction was developed to make reloading of the source electrode easy and trouble free. 2.1 – These latest revision of the reactor tube was an expansion of the internal bore diameter to increase the flow rate. They have an outside diameter of 13mm. The fundamental Blueprint is nearly the same for 2.0, 2.1 reactor tube formats. Output ports at the top may vary as that has been a subject of experimentation along the way. Currently, the 2.1 reactor tubes have 3 large slots on one side. The Method we use to gage the concentration is the quantity of gold vaporized. 1mm of 22 gage wire = 6.11mg of gold. This is the standard we use to determine 100ppm. Aside from using the weight or volume to determine the quantity of gold in a colloidal gold, the only other options for accurate reading of content are expensive and not available to the general public. In fact, these other means are not even available to us without spending money for a qualified lab to do it. No shipping charges! These rates are for everyone, everywhere! As long as you live on planet earth this is what you pay! In other news I have a potential new colloidal gold product though it is so unique I don’t yet know where to go with it yet. Did you know that the silver coating on a mirror is considered a colloid? In the same way this sea salt was coated with gold and is also a colloid. The reason I decided to bring this into form was firstly to establish a type of colloidal gold that could easily be transported without refrigeration or special dark place to store it. Second colloidal gold has a lot of weight because of the water volume. My solution was to figure out how to get a refined colloid of gold onto the surface of salt. Heck, it may even be better for absorption and such things who knows? These photos are from my first run samples and are probably much lighter than I would like for a production run. It is a known fact, in physics research for instance, that very small metal particles may take on super conductive properties under the right conditions. – http://micro.magnet.fsu.edu/micro/gallery/superconductor/super.html – The pairs of electrons created by this process are widely known as Cooper pairs and the theory upon which their existence is based was named BCS theory in honor of its developers. Most of the superconductors that are believed to be governed by BCS theory are metals and metalloids that show some conductivity at room temperature. If you study the up and coming nano-tech revolution (yes, it is lots of hype for sure only today that hype brings money to good research as well as bad) you may find colloidal gold in one form or another to be nested within more than one nano-tech field of research. 1.The growth of gold nano-wires, yes, gold wires just a few atoms wide!. 2.Superconducting transistors circuits, also a few atoms wide. 3.Superconductive Cooper-paired gold atomic clusters known as G-orme. While there is much more, I offer these ideas only as an introduction to the possible uses of colloidal gold or related to production methods of colloidal gold, platinum and palladium. What we make here is unique in that we do not require a chemical bond or transition to derive our product form. These are undisturbed gold particles just floating around in water. Such a thing is more difficult than it seems though ultimately easy enough to provide concentrations of 100ppm for a reasonable price Especially if you compare chemically derived noble metal colloids and the limitations with chemical cocktails. Certainly a high concentration colloidal gold has applications for individuals that require the processing of gold toward some objective or result that may find processes derived from what we offer may be far less expensive than other options available. I have personally derived what appears to be superconductive gold clusters starting with a colloidal gold base. Here is a photo of gold clusters clinging to a strong neodymium hard drive magnet. Notice how they gather on the special N pole in the center of the magnet. It should be understood that these magnets are specially designed for hard drive read/write heads and are polarized N in the center, S on the two outer range limits for reasons of head positioning. Pictured from the left to right is my first precipitation of colloidal gold after being annealed. The magnet was passed over the annealed sample and a large percentage was lifted and bound to this N pole at the center of the magnet. 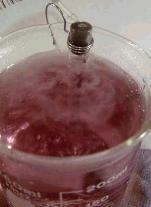 This was achieved by adding a mild acid to colloidal gold and then adjusting the ph until I had a precipitate. I dried the precipitate and then annealed it to red hot in the open air. I tried this again, only instead of the large gold clusters you see in the photos above, I had a much more refined brown product with the same properties. In either test, I found these results of interest as I had obviously not broken the gold down into a high salt gold chloride as is prescribed in the Hudson Patent for making G-orme. Apparently some percentage of my samples had achieved a cooper paired state or it could be that sodium itself may be acting as a superconductive or diamagnetic residue. Could it be that the fine colloidal particles allowed a chemical change undetected by the crude means employed here to indicate chemo-kinetic activity? This is my second go at the same process. 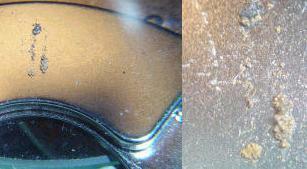 The photo on the right is 40x magnification to show the fine grain structure to the material. 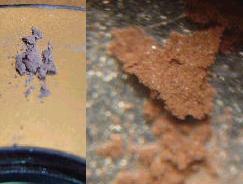 The brown is a result of the gold clusters in this sample. The first sample was annealed on a stainless steel spatula while the second one was annealed on a platinum spatula to rule out any ferrous metal contamination. Is this proof of super-conduction at room temperature? It fits the profile, though more research would have to be done before we can know exactly why this odd magnetic response is happening. This does, however, support the list of possible uses I have sited that deal with nano-tech and possible electronic applications that have yet been unrealized by industry! In electro-dynamics the potential uses for a superconductive capacitor or a new application in conventional electrical engineering could open doors for technologies that would seem like magic to use today! Many people take colloidal gold as a dietary supplement. Though there are many sites on the internet that talk about the many potential benefits of colloidal gold as a dietary supplement, we are not going to make any claims on this web site about what it could or can do for you, no testimonials, nada. I’ll get behind that since this is true enough. Gold is a good conductor of electricity and never corrodes. Gold is used in medical research to ‘stain’ nervous tissues. Apparently nerve tissue has an affinity for gold. Fancy that! A non-corrosive, highly conductive metal that may be drawn to nervous tissues!?!?! Maybe there is something to this after all? If you are someone who wants more information on the use of colloidal gold as a dietary supplement, I suggest a search engine or this yahoo group that has a large group of people who are using colloidal gold as a dietary supplement. If you have tried colloidal gold make sure you visit this group and share your experiences good or bad. Here is one of many peer reviewed articles on Meridian Institutes web site. When I first read this article sent to me by one of the many contributing members of the colloidal gold community, I learned things that I had never heard anywhere else. Read for yourself, I was impressed. My further advice is to believe absolutely none of what you read from anyone, who will gain from your ignorance, unless you have researched the subject well enough to agree or disagree without guessing. In either case, by the time you have learned enough to make an informed choice, you may find that most of what you read where profit is to be gained is sorely lacking in actual content. The truth is rarely found in advertising. Be careful of ‘dosage’ charts and other unsubstantiated diatribe as it could very well be presented to justify the prices you are paying, not to benefit your experience with the use of Cg as a dietary supplement. The benefits of colloidal gold are obviously not traditionally medical. No chemical reactions, no toxic reactions to consider (in general- any metal can become toxic in large enough quantities) then dosage is not a chart or a fixed number of ‘medical’ effects designed for every person but an exploration in the subtle changes of a bodies’ electrical nature. The primary effects (should any occur) are the direct result of the change in conductance for parts of the physiology that may take on gold; such as nervous tissues, sexual organs. Consider the importance of electrical conductance in the body and suddenly a world of possibilities opens. An effect on mood, a sense of well being? What aspects of life influence these factors? Electrical ‘medicine’ is the right frame of mind to begin understanding any benefits that may come from colloidal gold. The very idea that the electrical patterns of the body are a junction between free will (the soul) and physical action should help to frame the areas of life that colloidal gold has made attractive to so many who have sought it out and used it. Trust your own observation and experience, take everything else with a grain of salt. Realize that monetary interests have taken priority in the holistic industry as many have been drawn by the allure of easy money and people who apparently believe what they are told so long as the right buzzwords are used and the claims seem credible. Is colloidal gold something that could change aspects of your life for the better?OrIs colloidal gold just some pretty red liquid stuff? There is nothing like the look of gold and the colors that are possible using gold to stain various works of art, metals, glassware and who knows what? One would be hard pressed to locate true gold stained red glassware today. Alternatives to pure gold as a glass stain have replaced this once vibrant colorant process which was essentially colloidal gold. If you want to know what that glass might have looked like, all you need to do is examine our product. It looks much the same though slightly more pink or orange than the bright reds that were once achieved in the art of glass coloration with gold. A super close up of the electrodes from an early setup showing the gold to red contrast from left to right. CG can turn out purple when the particles of gold are larger.